BigFoot has been discontinued by Milford Instruments. 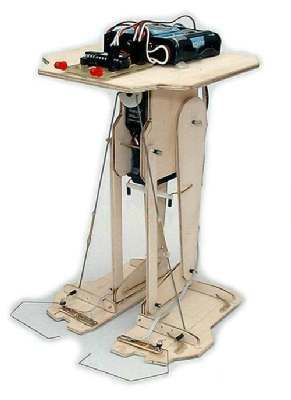 BigFoot is the original two servo Biped Walker and many copies of the design can be found on the web including Toddler from Parallax Inc. BigFoot was designed by David Buckley and aimed specifically at the beginner in electronics and robotics. The control-board is ready assembled consequently the kit requires no special knowledge of electronics. The BigFoot kit is easy to assemble using a small screwdriver, a pair of pliers and wood-glue. BigFoot has two servos enabling true biped walking and turning, stands about 22 centimetres high and weighs 450 grams (8.75" high and weighs 16oz). Power is supplied by four AA cells and the control processor is a Basic-Stamp1 from Parallax Inc. The two servos allow BigFoot to shift its weight from one foot to the other and lift either foot off the ground and also to move its legs forwards and backwards. Turning is done by standing upright and sliding the feet in a tank style turn. A simple fully documented Basic program is provided. 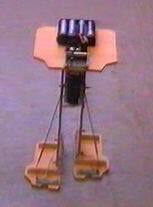 The supplied program operates BigFoot in a static balance walking mode. BigFoot is fitted with two toe switches, one on the front of each foot, activated when the wires seen in the photo touch obstacles. Bigfoot can then be made to step back and turn away. BigFoot is available from Milford Instruments, see >Robotics>BigFoot>.